“a drunken savant mumbling through organic esoterics” featuring work by Elizabeth Blair, Brian Ellis, Lewis Freedman, Kari Freitag, Elisa Gabbert & Kathleen Rooney, Andy Gricevich, MC Hyland, Tony Mancus, Jenn Marie Nunes, Edwin R. Perry & Chelsea Tadeyeske, Stepha Peters, Bethany V. Price, Meg Prichard, Chad Redden, Chris Shipman, and Luis Humberto Valadez. silkscreened black on white textured cardstock with artwork by Cat Ries. The guts are printed on a 24lbs. stone linen. 20 pages. 16 pieces. 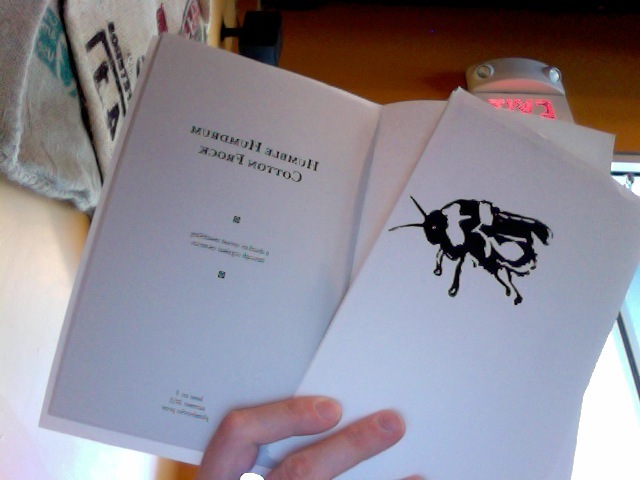 Compiled, edited and constructed in Mke, WI, Summer 2012 by Edwin R. Perry and Chelsea Tadeyeske. rather not use paypal? want to purchase more than one book? want to trade us for a book you’ve made? shoot off an e-mail to plumberriespress@gmail.com and let us know what you’re thinking.